ProfG has put an interesting question about whether DMT are all born equal. Whilst the influence on relapse rates is much clearer in terms of the hierarchy, the effects on brain atrophy has led ProfG to ask a sensible question. It was suggested that HSCT and alemtuzumab are up there at the top of the pile in the atrophy states, leaving the B cell therapies in their wake. B cell therapies are suggested to be ocrelizumab and cladribine, which appear to be rapidly becoming best sellers as they lack the side effect risks of the two mentioned above. Are you making the right move? I have argued that HSCT, alemtuzumab, natalizumab, cladribine and ocrelizumab will have high efficacy in terms of blocking memory B cells from getting into the CNS and so should slow relapsing MS similarly. We know that relapses cause nerve damage and so blocking them must surely block nerve loss and slow accumulation of disability. So they should all be more of less the same. However, are they? If they are not the same, it tells us something. But what it is it? First is there is a real difference? Brain Atrophy is perhaps a rather useless outcome, because it is not really detecting, what it is claimed to be detecting, which is a loss of brain nervous tissue. As such artefacts are made by brain shrinkage (from effective anti-inflmmatory activity) and brain swelling (from inflammation) and space filling of glial cells to replace lost tissue. As a result we have had some trials throwing away potentially neuroprotective agents treatments. It is only seeing the tip of the iceberg when it comes to detecting nerve loss and depending on how they measure it they can get better or worse results as it is not truely standardised. Yet we (i.e. neuros, persist on using it, because it is easy, when things like grey matter atrophy may seem of more value. If there is a difference is the benefit of HSCT because HSCT and alemtuzumab (and natalizumab) hit the innate immune system like macrophages, which cladribine and ocrelizumab are not going to do as much. This would fit with the idea that macrophages are important in progressive MS.
We have rehearsed the argument about CD4 T cells are their involvement in MS, but besides a selectivity or dimethyl fumarate for CD8 this T cell subset has not be adequately tested. Remember cladribine depletes CD4 T cells by about 40-50% in year 0-1 and 50-60% in year 1-2 so if it is CD4 T cells then the depletion needs to be better. However, what about CD8 T cells? Cladribine is less effective at depleting CD8 T cells. CD8 T cells are the dominant T cells by about 8 to 1 in MS lesions and they are cell killers. (In most EAE models CD4 T cels dominate). Are they at the heart of the nerve loss and the brain atrophy? If this is important, should we deplete B and CD8 T cells? However, will this give us secondary autoimmunities? Surely no more than currently with alemtuzumab and you would leave the CD4 T regs intact. However, we ask do the drug s stop progression?. The simple answer is no! Disability worsens with all treatments, although they may influence and have been shown to slow the rate of development of assignment to secondary progression. We believe the earlier you start treatment the better it will be. Once you damage a nerve then the dying back of the nerve occurs over months and potentially years. Therefore, the longer disease has developed the more nerves targeted for destruction will occur. So if we look at the trials. People are getting alemtuzumab on average 2-4 years earlier than ocrelizumab and 5-7 years earlier than cladribine although use of ocrelizumab is in the ball park of some HSCT studies. Now it is argued by Prof G that it has been shown by de Stefano et al. in 2010 (Neurology) that atrophy occurs at the same rate across MS. However, this is with a previso. In the study indicating the similar rate of atrophy they normalised the data to the size of the brain (Which shrinks) at baseline, but this was not done in many of the MS studies. If you do not do this, then there were big differences. First sign volume loss was 0.4%, relapsing MS was 0.49% (mean duration 7 years) and SPMS 0.64% (duration 15 years) and PPPMS 0.56% (duration 8 years) . In the cladribine trial the placebo group was much higher than 0.49%. However we could ask. Why is alemtuzumab is seemingly so good? People getting alemtuzumab had a short disease duration and should have the best neurological reserve. However, did it shrink the brain during year 1 of treatment causing pseudoatrophy, but once you go treatment-free will the brain re-swell making it look bigger than it i,s especially as 50% of people treated get disease activity re-emerging. The manufacturers have repeated been asked to show this data, so see if pseudoatrophy has been reversed. Yet no response. Are they hiding something? Now to sorry old cladribine languishing at the back of the queue. I bet they (manufacturers) wish they had something to hide, but in reality the data is probably not great because the cladribine programme was terminated before the studies were properly completed in the extension studies. Will they go back and do a study in early MS? Did they measure atrophy in the ORACLE study, I can’t see it in the protocol at clinical trials.gov..
You also have to rememebr that the killing of immune cells is slow with cladribine and takes 2-3 month for maxium effect not like a few days for alemtuzumab, so pseudoatrophy is going to be maximal later than with alemtuzumab. But the data from 12-24 months does not put it in the alemtuzumab league. Will the cladribine atrophy extension data arrive? I suspect there is a disincentive to publish it now as would they want to show their drug in a bad light. However, it will probably be a bit of a dog’s breakfast because of the gap created by the termination of the programme. ProfG has wondered whether cladribine gets in the brain to target B cells and asked whether this will that make a difference. A theorectical possibility. However, alemtuzumab is not really going to get in the brain and it doesn’t get rid of the oligoclonal bands and so that will not probably not explain the difference in atrophy. Now, I know this doesn’t help you with decisions but the point is the data is not easily comparable and so having a look at a few papers and there is some confusion. The results from the natalizumab and the HSCT trials (above) are hopelessly underpowered (too small) and need hundreds of people if the data is to be meaningful. I have not included anything from year 1 as the brain volume shrinks with effective immunotherapy (pseudoatrophy). Why because although the atrophy data intially in the phase III opera I & II were not that great with an annual lost of over 0.4%. In the extension trial by year 2 the rate of brain lost was within the healthy control range. However they baselined at six months rather than zero so it makes it harder to compare to other studies. For this reason I have ignored the first year when there is shrinkage. But how much shrinkage may influence the later time points. This is supported by studies with rituximab. The Brain parenchymal fraction (brain volume) was reported as -0.19% assessed in 160 pwMS (Salzer et al. Neurol 2015), so what is the difference? Doesn’t this data confirm HSCT as the winner? Lemtrada looks very good too. This has really helped make my mind up about what treatment I am going to choose. I hope my neurologist plays ball. No you can only moderately compare Alem vs Ocrevus because those are the only ones with a reasonable sample size (Clad doesn’t have any data). Even then, Ocrevus patients were on average almost 5 years older and presumably farther along in their disease as indicated by higher EDSS. 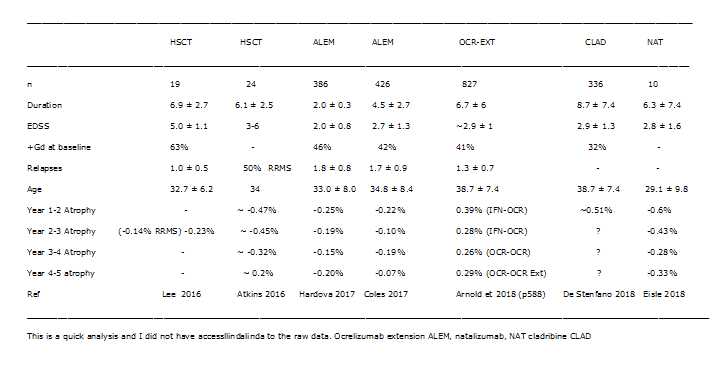 Regardless, Alem appears to work a bit better than Ocrevus, likely because of depleting both B and T cells. HSCT and Tysabri/Nat do not have enough power to compare with anything, and their starting populations are still different/selected as compared to Alem and Ocrevus (HSCT especially by picking highly active initial patients). Thanks MD for a really illuminating post. The brain atrophy data wouldn’t matter if it wasn’t in compliance with what we know from studies about progressing to PMS. Lemtrada does have the smallest percentage of converting to SPMS among DMTs not only in one study (I guess the rest who convert do not respond to the drug as they should). We similarly know HSCT patients from 15 years studies. In contrast we know from case studies and Prof Hauser (through ProfG) that 10 years on Rituxan did not prevent patients from converting (long before O.). The rest DMTs can be seen here https://jamanetwork.com/journals/jama/article-abstract/2720726. So they must be doing something right when they measure brain atrophy rates, as they get confirmed. I am sorry that you bet on the wrong horse with the B cell theory but you are left behind by being stuck to it. The equation B cells=EBV is too simplistic. It doesn’t work that magically, either in MS or other autoimmunes. Follow ProfGs lead, he is making more sense. I think you are incorrect in interpreting the data and the possible caveats with how the older trials were structured and potential newer trials with first line use of Ocrevus from the get-go without going through four years of CRAB therapy. suggests that use of Rituxan is beneficial for both RRMS and SPMS and delays disability progression. “Researchers found in the covariate-adjusted analysis of the matched groups, patients with SPMS who were treated with rituximab had a “significantly lower EDSS score” during a mean follow up of 3.5 years (mean difference, –0.52; 95% CI, –0.79 to –0.26; P <.001). Additionally, the time to confirmed disability progression was significantly delayed in the rituximab-treated arm of the study (hazard ratio, 0.49; 95% CI, 0.26-0.93; P = .03). That directly contradicts your suggestion that B cell therapy isn't useful. The JAMA paper you cite suggests all of the drugs have an effect, some are better than others. I can't find specific publications from Hauser (yet) that talk about conversion from RRMS to SPMS while on long term Rituximab. If you have the link, publish it. You misinterpret my comment. I did not support that B-cell therapies are not useful in MS. My comment was targeting MDs theory on MS, which goes much beyond the undoubt usefulness of B-cell therapies. I am well aware of the effectiveness of those on treating MS inflammation and slowing progression. My point on the JAMA paper was to correlate the brain atrophy rates we have with convertion to PMS which match perfectly in hierarcy. I would prefer a comment from MD on his MS theory. ProfG has some great late posts on each therapy and their effects on brain atrophy and I wouldn’t try to explain better. yes a throwaway comment to ProfG, if true important to publish. Sitting on data you dont want people to hear is terrible….The phase II trial extension data is another example. Hauser is a one hit wonder from year 2000..
retired/faded away years ago..no work on EBV. Let’s see the data, but you are wrong my friend, if I need to adapt my views, I adapt my views, It is call science. I am not scared of speculation, I am not scared unpleasant data…it simply needs to be explained. However, as to B cell theory why should the idea be dropped. What is your evidence? EBV and B cells too simplistic..sure I don’t know enough yet. You buy into the B-T argument, it doesn’t make the B cell idea wrong, it means you add the T in a sensible way or may be the macrophage. However, blindly accepting dogma has got us where we are today…you don’t have to do it. I agree with MD on this. There is no doubt the peripheral memory B cell is vital in driving focal inflammatory activity in MS. Does it do this independently of T-cells or not? I suspect not; I think the memory B cells present antigen that they pick-up in the CNS, via their immunoglobulin receptors, to present via the MHC to T-cells in the CNS. What is important in this debate is to use some of the emerging insights to design better and safer treatments for MS? For example, more selective T & B cell depleters. Or less intense IRT followed by an anti-CD20? Or alemtuzumab followed by rituximab? Or an anti-viral targeting EBV after a NIRT or SIRT. Etc. If we could we would have started the alemtuzumab-rituximab study 5 years ago. But Barts has 1000s of MRI scans on their servers already. Why don’t you establish a BVL assessment protocol a look at your own material? No need to recruit patients at least and a small grant to pay few radiologists and a statistician will be enough. Where is the evidence to support the claim that “Disability worsens with all treatments”? The extension data for the phase II and phase III alemtuzumab trials suggests that most patients achieve stability or improve in their EDSS scores, while some patients unfortunately see their EDSS scores increase. Look at the Coles et al. 2006 you can see disability worsening. The point is that if you do not get on top of your MS and start treatment late then you will have more of the process leading to slow burning disability.